This working paper presents three case examples demonstrating the potential for overseas migration to improve population growth, sustain a skilled labour pool, and grow the economy in northern and remote Australia. Since 2013, northern Australia has experienced a large downturn in its population growth rate, and negative growth in some areas. This followed the highs of the mining boom and was due to net losses of residents to southern regions. Under these circumstances, positive contributions of migrants to population, jobs, and communities have become increasingly important. Existing studies show that northern and remote regions of Australia fare poorly at attracting and retaining international migrants. However, an important consideration in evaluating the success of policies and initiatives for attracting and retaining migrants to these regions is how these are assessed and measured. For many communities across the north, permanent retention of a handful of skilled migrants and their families can significantly improve demographic and economic trajectories. Evaluations on the success of schemes at macro-region levels may miss nuanced and significant population impacts at the local level. This working paper presents three case examples from the Northern Territory demonstrating the potential for overseas migration to alter demographic, economic, and social pathways for northern and remote communities, and thus the broader region. Northern Australia is a geographically vast and diverse region that crosses the three jurisdictions of Western Australia, the Northern Territory, and Queensland (Figure 1). Population diversity within the region is also a prominent feature. Here, diversity exists in the basic characteristics of communities including their age structures, cultural make-up, gender balance, and migration patterns. In the north, peripheral and marginalised economies and the small sizes of settlements mean substantial population changes can result from relatively small events, for example a cluster of migrants arriving from overseas or a few teenagers moving away for work or university. Even ‘big’ cities in the north such as Cairns and Darwin are small by national and global standards. Consequently, settlements are subject to localised and rapid changes from multiple internal and external factors. extreme climates which makes remote and northern areas subject to natural disasters. 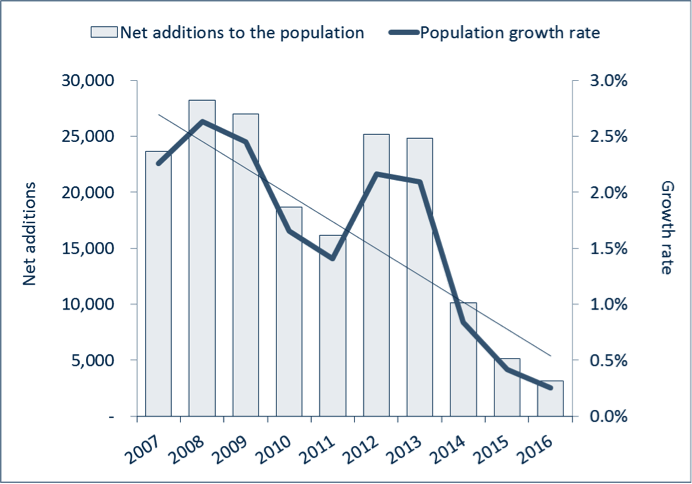 Since 2013, northern Australia has experienced a large downturn in its population growth rate and the number of net additions to the population (Figure 2). Estimated growth for 2015 to 2016, for example, was just 0.3 per cent, compared to five times this for Australia as a whole at 1.5 per cent. While population growth in northern Australia remains slightly positive, some regions have been in decline. In some areas, long-term population decline has resulted from reduced employment in agricultural industries, while in others reduced growth rates coincided with the end of the mining boom. For regions such as the Pilbara in Western Australia and Moranbah in Queensland, growth was high and rapid during the mining boom, but has declined significantly in the years after. Successive Commonwealth governments have seen population growth in northern Australia as important to the nation, both economically and strategically. This is highlighted in the 2015 White Paper on Developing Northern Australia and follows on from a number of past national strategies for developing the north. The White Paper details aspirations to increase the size of several northern cities to more than one million residents and to grow the population of the overall region to four to five million by 2060. With the population of the largest settlement, Townsville, at around 235 000 residents in 2016 and the region estimated to have a population of 1.3 million in 2015, these targets are very ambitious. This large decline in growth rates in the north is almost completely associated with changes in migration flows between northern Australia and southern Australia. From 2006­–07 to 2014–15 the number of new residents arriving from southern Australia to the region fell by 14 per cent. Meanwhile, residents departing from northern Australia to southern Australia also fell by 5 per cent (Figure 3). From 2006–07 to 2009–10, arrivals exceeded departures, with internal migration contributing positively to population growth. However, despite this, arrivals fell by more than departures (a 14 per cent decline for arrivals compared to a 5 per cent decline for departures), creating a net annual deficit for internal migration of almost 12 000 people by 2014–15. These types of fluctuations in population growth are not new to the north. Sustained and long-term rates of population growth have eluded the region. This is despite the pressures of continued urbanisation in southern Australia and marked increases in housing costs in the big urban centres, and taxation-based incentives to encourage people to live in northern Australia. Technology may have played a part by increasing agricultural productivity and reducing labour demand in some regions. Technological improvements may have also lessened the need to situate services and people in the north. For example, flights from Europe to southern capital cities used to stop in the north of Australia to refuel, but aircrafts now have sufficient ranges to avoid the need to stop there. Some academics have argued that the demography of areas such as northern Australia have resulted from industry’s focus on minimally processed resource assets (such as timber, coal, and raw metals) and that this has served to reduce the traction of policies aimed at stimulating greater economic diversity. In addition, even seemingly booming economic conditions may belie the true situation in relation to employment and growth, and population change may be a good indicator of this at the local level. For example, at the same time as population growth has fallen to close to zero in the Northern Territory (and indeed into the negative in some recent quarters), gross state production has been at record levels and unemployment rates have been very low. This was due to the combination of capital investment and construction associated with a significant (A$34 billion) gas refinery near Darwin, which employed a predominantly interstate and overseas-based workforce, and those at the end of their employment tenure moving interstate for a variety of reasons including jobs, to be with family, and push factors such as climate and costs of living. The uneven distribution of comparative advantages within the region, alongside its size, make it inevitable that only some places within the north will experience sustained population and economic growth. These are likely to be the large cities that have ports and other key infrastructure, which are also the places where more people choose to reside. A 2017 Productivity Commission report has shown that regions outside of large cities lack adaptive capacity, based on a composite index consisting of a number of social, demographic, and economic measures (Figure 4). Other academics question the focus on population and economic growth of northern Australia altogether, emphasising the important biodiversity and cultural history (particularly in relation to Aboriginal and Torres Strait Islander peoples) of the regions and the people of the north. For governments of northern jurisdictions, however, population growth remains important to sustaining their share of the national pool of funds generated from the Goods and Services Tax. This working paper demonstrates the potential for overseas migration to alter demographic, economic, and social pathways for northern and remote communities, and thus the broader region. 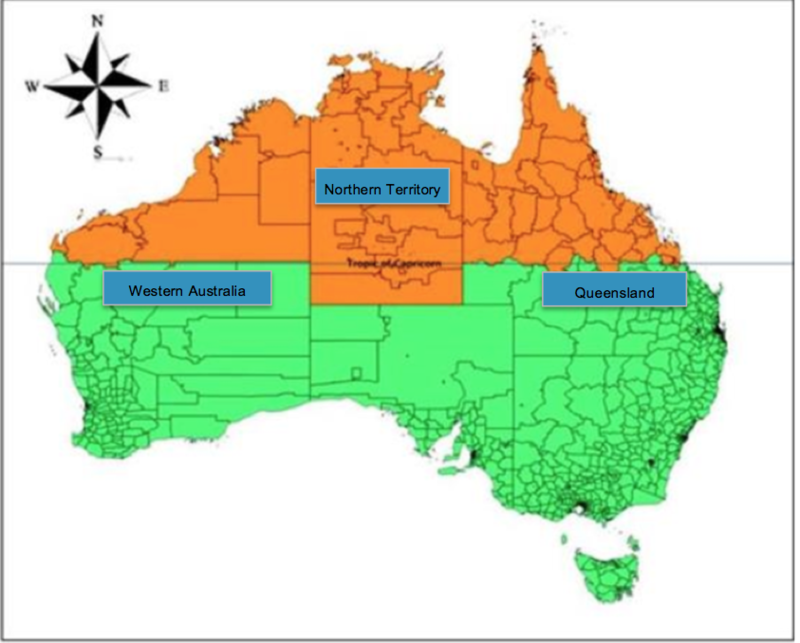 It presents three case examples from the Northern Territory from a population perspective. While the Northern Territory is only one of three jurisdictions in the north, it is representative of the issues discussed in this paper for northern Australia. Case examples of the rapid emergence of new migrant communities (those from source countries previously in very low numbers in the population) in Alice Springs and an evaluation of the Regional Sponsored Migration Scheme (RSMS) and State Specific Regional Migration (SSRM) schemes in the Northern Territory are followed by analysis of the national competitiveness of that jurisdiction for migrant attraction and retention. Northern Australia is becoming increasingly dependent on international migration to keep population growth positive. Contributions to the population from natural increase (the excess of births over deaths) are positive and relatively stable, but are quite small when compared to migration flows. Net negative interstate migration means the north must attract and retain new and long-settled migrants to the region. 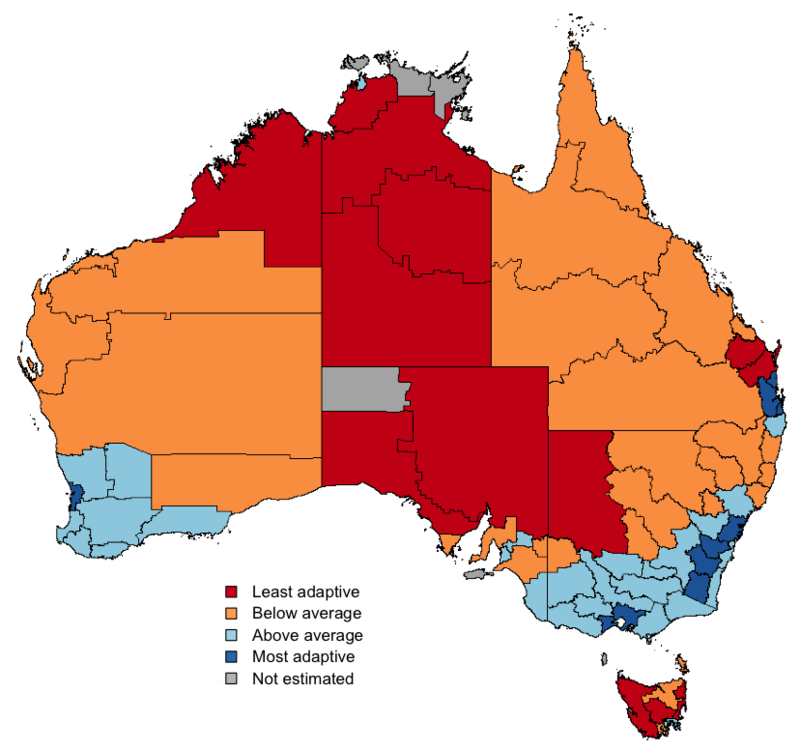 While this holds true for parts of southern Australia, the scale of interstate migration losses from northern Australia in recent years (see Figure 3) in relation to its population have been large. During the mining investment boom, from around 2003 to 2014, net international migration reached record levels led by skilled migration schemes. A long-term and significant increase in the numbers of skilled migrants and the share of the skilled stream to the overall permanent migration intake for Australia has occurred in the past two decades. Prior to the mid-1990s, skilled migration streams comprised just 20 per cent of the permanent migration intake. This increased sharply under the Howard government (1996–2007) and grew by 360 per cent, from 25 000 in 1995–96 to 115 000 in 2010–11, to comprise 67 per cent of the total intake. In 2015–16 skilled stream migrants comprised 68 per cent of the national permanent migration program intake of 190 000, with family stream migration (i.e. family reunion or family ‘chain’ migration) making up the majority of the remaining permanent stream at 57 000. These figures included not only the skilled migrants themselves, but also their primary partners (at the time of the initial application by the skilled immigrant) who received a skilled immigrant visa but were not assessed for the visa, thus increasing the capacity for future positive influences on population growth as these families have children. Both schemes incorporate measures to encourage skilled migrants to reside and remain in remote and regional areas by offering incentives such as reductions in the number of eligibility points required for obtaining permanent visas. These schemes allow northern jurisdictions to maintain their own skilled occupation shortage lists to target the intake of migrants to their specific and changing needs. Although the RSMS and SSRM schemes may help attract skilled migrants to northern Australia, migrant retention in the north is still relatively poor. Leakage of skilled migrants to southern regions and overseas (largely return migration to the source country) is a long-standing concern. Employment is a key factor for attracting skilled migrants, but new employment opportunities may also draw people away from northern areas. Other factors that may draw migrants to southern Australia include sub-standard provision of services such as education and health, the costs of housing, and the cultural and social needs of new migrants. Geographically-specific studies also point to high rates of leakage once residential obligations for individual visa types are met as well as low rates of actualisation in terms of intended settlement commitments. These and other dynamics have been seen as contributing to lower rates of population growth than what might have been experienced with better retention of skilled migrants and their families. However, an important consideration in evaluating the success of policies and initiatives for attracting and retaining migrants to northern Australia (especially skilled migrants who are costly to recruit and settle) is how these are assessed and measured. Examining net migration numbers and rates based on amorphous regions may be less insightful than detailed reviews of individual and localised programs and initiatives at localised levels. For many small and remote communities across the north, the permanent retention of a handful of skilled migrants and their families can significantly improve demographic and economic trajectories. Evaluations on the success of schemes at macro-regional levels (for example, for northern Australia as a whole) may miss nuanced and significant population impacts from local-level initiatives, schemes, and community actions. the successes of localised and targeted interventions are more readily assessable and may hold promise for other locations and regions through adaptation or modification. The case examples that follow are from a population perspective. They demonstrate the potential for overseas migration to alter demographic, economic, and social pathways for northern and remote communities, and thus the broader region as a whole. All three case examples are situated in the Northern Territory. While it is recognised this limits the discussion to only one of three jurisdictions in the north, it is reasonable to argue that the Northern Territory provides suitable representation of the issues of migrant retention for northern Australia as a whole. For example, the Territory’s population distribution is comparable to the north overall, with a large city (Darwin) in which half (and increasing numbers) of the population reside. The remainder are spread over a vast area in smaller towns and discrete communities comprised of high proportions of Indigenous Australians. 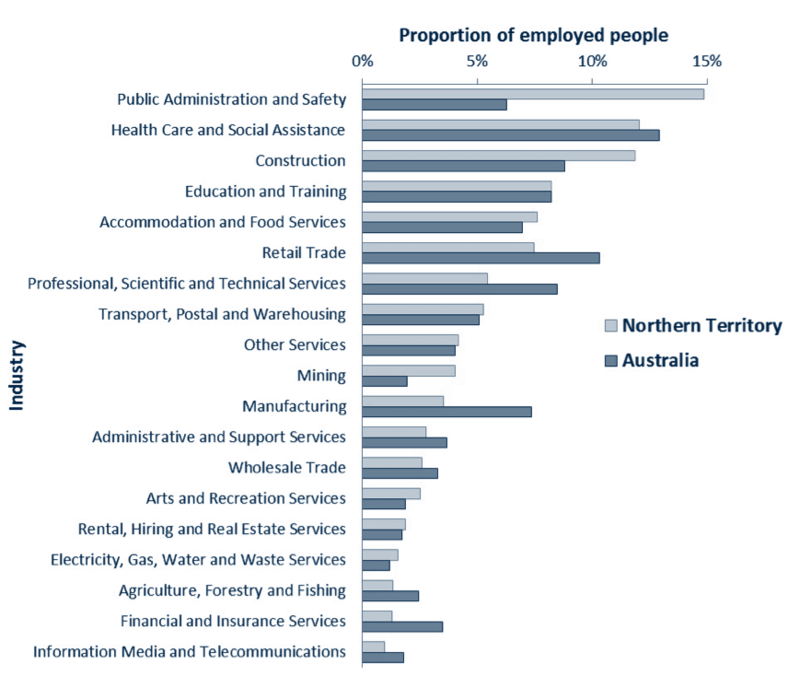 The employment and industry profile of the Northern Territory also emphasises the relative significance of government employment when compared to the rest of Australia (with almost triple the proportion employed in public administration and safety) and a lower proportion employed in retail trade, professional, technical and scientific services as well as manufacturing (Figure 5). The case examples, therefore, are intended to stimulate discussion on the types of initiatives and policies that might facilitate population growth at localised levels, rather than as a commentary on the complex and changing economies of the north, although the two are of course linked. Alice Springs in the Red Centre of Australia (and considered part of northern Australia) had a population of 27 000 in 2016 with resident numbers hovering between 25 000 and 28 000 during the decade prior. Just under one in five residents (18 per cent) was Indigenous in 2016, and the town is an important service centre to the surrounding Central Australian region where nearly 80 per cent of the population are Indigenous. Alice Springs is a focus for tourism, as a base for visitors to experience Uluru and Watarrka National Park. It is the second-largest settlement in the Northern Territory after Darwin (population circa 140 000). Although the town has never quite reached 30 000 in official population estimates, it is seeking to grow to above that as a threshold that attracts additional funding from the Australian Government. Alice Springs more often than not has an annual net loss of residents through migration, both interstate and within the Northern Territory. More specifically, as for most of northern Australia, it loses teenage residents on a net basis through migration, particularly for education elsewhere, has a greater in-migration of males than females, and loses retirees to interstate. Population turnover and the excess of men have led to shortages of skilled workers in the past decade, particularly for the relatively large health and social services sectors. The town also hosts the United States base of Pine Gap, thought to employ around 1000 staff. During 2009–2011 the Northern Territory Government’s Department of Trade, Business and Innovation, which is responsible for recruiting skilled migrants under the RSMS and SSRM, made targeted visits to overseas regions where they were likely to attract skilled migrants and their families to northern Australia. This strategy sought to fill skilled vacancies in the Alice Springs Hospital (a large regional hospital with an emergency department) and other health-related occupations. Census data for Alice Springs for 2011 revealed the strategy was highly successful. The town had an emergent and rapidly growing cohort of new migrant communities from India, the Philippines, and Zimbabwe, which are quite different to source countries of the past such as the United Kingdom and the United States. Without the arrival of these new migrants, the town’s population would have fallen by 5 per cent. The intake also changed the demographic profile of Alice Springs, raising the overseas-born population share to 20 per cent, equal to the Indigenous population. Table 1 shows the growth of the new migrant communities with a rapid rise in the size and prominence of the Indian and Philippine communities most noticeable. A full examination of the data reveals occupations for new migrants were concentrated in the healthcare and social assistance sectors and dominated by women, most of whom came with partners or a small family. Male partners of these newly attracted health workers were employed across a wider range of industry sectors (Figure 6) and in a range of occupations including nursing support and personal care workers, shelf fillers, taxi drivers, cooks, registered nurses, chefs, and aged and disabled carers. New migrants to Alice Springs, and especially the women, were highly educated and qualified compared to other residents. By identifying the languages spoken at home, 56 per cent were found to have originated from the Indian state of Kerala. Kerala is one of the most progressive states in India and has a millennial-long history as an international sending region for working migrants. Of all Indian states, Kerala has the highest Human Development Index for education and health, the second-highest income index, highest literacy rate, and the most women per 100 men in the population. Its population is highly suited to sending skilled migrants to northern and remote regions of Australia, both in terms of filling skilled occupations and redressing population imbalances and low growth. Impressively, the data shows that 86 per cent of new migrant’s occupations in Alice Springs matched their qualifications, a factor which is likely to help retain them in the town. New migrant communities in Alice Springs offer the potential to further grow the town and change its demographic, cultural, and social make-up. First, clusters now living in Alice Springs provide the opportunity for chain migration under family stream migration programs. This may have long-term effects on population growth, especially as the existing communities are relatively young with a greater proportion than the overall population in partnered relationships. The latter creates opportunities for growth through child bearing. Importantly, new migrants are likely to attract friends and families to visit the Red Centre, generating further income and business opportunities for the town. Second, this highly qualified cohort may seek further education, presenting the second-largest employer in the town, the university, with a new and relatively highly paid market. The key to realising these opportunities will be retaining new migrants which, given their qualifications and experience in occupations in increasing demand elsewhere in the country, may be difficult. Ultimately, retaining new migrant communities could be the key to the town reaching the goal of 30 000 residents, and marking long-term success for this highly targeted intervention. Retention will depend on ongoing employment opportunities and the provision of things that most migrants seek: good education, health care, and housing; community safety and vibrancy; and continuing acceptance in the community. Substantial efforts have been made to attract skilled workers to northern and remote Australia under the RSMS and SSRM schemes. It is crucial to understand whether such programs are succeeding in filling skilled vacancies and contributing more holistically to the population and livelihoods. Simply put, the retention of skilled migrants and their families within such areas and within their occupations reduces employee turnover costs and provides greater population stability. In light of overall pessimism around skilled migrant leakages from northern and remote Australia to larger cities, this case study provides an assessment of the contributions of the schemes to the Northern Territory. During 2012 a survey was conducted of skilled migrants who had arrived in the Northern Territory between 2008 and 2011 under the SSRM and RSMS schemes. It canvassed demographics, family details, visa classes, places and length of residence, employment history, and satisfaction with employers. There were 166 completed responses for the SSRM (a 50 per cent response rate) and 278 for the RSMS (a 45 per cent response rate). Although the research is a little dated, it does provide relevant indicators on the performance of the schemes for informing similar policies into the future. Table 2 summarises the results under the themes of demographic contributions, labour force contributions, and retention in the region. The final column provides some indicative comparisons to the overall population. The results suggest that migrants who arrived under the schemes make significant contributions economically and demographically. They also showed positive indications about their likely retention in the region and the likelihood of staying with the same employer. Migrants were younger with a much higher partnering rate, and most partners were employed full-time when the study was conducted. Out migration rates and intentions to leave the Northern Territory were relatively low. * Survey responses were self-provided which means there were not the same definitions applied in comparison to the ABS data. This may explain in part the differences between results. Sources for comparison data: (1) Australian Bureau of Statistics: Table Builder program, custom data extraction by the author, 2013; (2) Australian Bureau of Statistics: Basic Community Profile, Northern Territory, 2011; (3) Australian Bureau of Statistics: Labour Force Australia data cube, October 2013; (4) Department of Immigration and Citizenship: Continuous Survey of Australia's Migrants, 2011. Note: The two-year out-migration rate is derived by the author using Census data (place of residence one year ago). 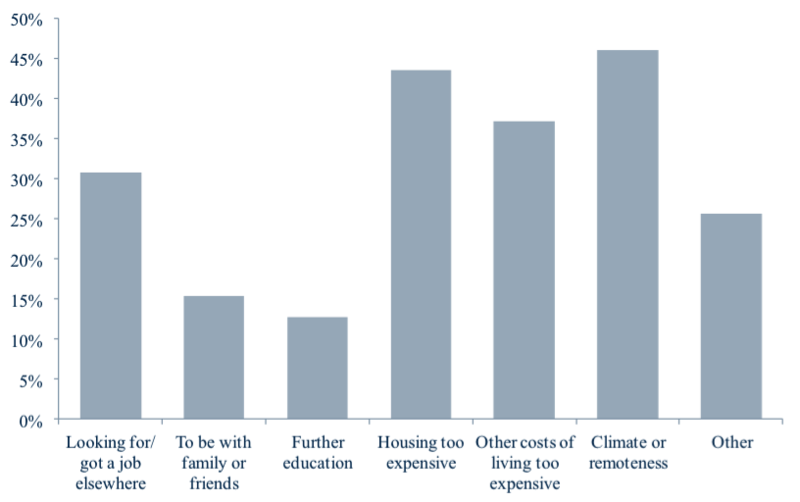 For those who had already left the Northern Territory or planned to leave, the main reasons were similar across the two schemes (Figure 7). Cost of living and housing costs were potential barriers to long-term settlement. This was consistent with past studies on push factors for skilled migrants in northern and remote areas. In the Northern Territory context, housing shortages, the lack of suitable accommodation and uncertainty relating to the housing market, or an inability to enter it are perennial problems, with rents and purchase prices high in the national context. Differences between the schemes on reasons for leaving were partly due to differing family and employment situations of respective migrants. For example, two-thirds of RSMS migrants had children compared to fewer than 30 per cent of SSRM migrants, making the cost of housing greater for the former, such that more RSMS respondents indicated they left or might leave due to housing costs (45 per cent compared to 30 per cent). Climate and remoteness was one of the main reasons for the likelihood of leaving for participants from both schemes. Overall the study suggests both programs are delivering positive labour market outcomes with only 2 per cent of SSRM participants unemployed at the time of the survey, about half the Northern Territory’s overall unemployment rate of 4.1 per cent. A greater proportion (6 per cent) of RSMS migrants were unemployed but this is likely a function of their arrival or existing presence in the country without having commenced with a sponsoring employer. Rates of RSMS retention in the nominated job and with the nominated employer were promising. More than 94 per cent were still with the same employer and 84 per cent were in the same job. The difference between these two figures suggests that 10 per cent of those who were still with their original employer had progressed to other positions in that organisation. Many skilled migrants (83 per cent for SSRM and 75 per cent for the RSMS, compared to 77 per cent for skilled migrants to Australia overall) settled with partners who were employed and contributing to economic output. At 1 per cent of the national population, the Northern Territory should, all else being equal, attract around 1 per cent of the national intake of migrants for each permanent migration visa scheme (net overseas migration (NOM) arrivals) and should lose no more than 1 per cent of those who leave Australia under each stream (NOM departures). This approach, while simplified, provides an indication of the long-term trends in the ‘competitiveness’ of northern regions for attracting and retaining migrants across migrant streams (note that comparable data for migration of visa holders from the Northern Territory to elsewhere within Australia are not available). This case study compares arrivals, departures, and net overseas migration in the Northern Territory for temporary work skilled (457), permanent skilled, special eligibility, and humanitarian and family streams for the period 2004–05 to 2014–15. Figure 8 shows the proportion of the national intake (NOM arrivals) for each of the main visa streams that settled in the Northern Territory compared to the its population share. The data suggests the Northern Territory has been quite successful in attracting more than its (population) share of family migrants, receiving around 1.5 per cent of the national intake on a consistent basis. It was also able to increase its share of permanent skilled migrants, but not by enough to match its population share (1 per cent). However, the share of national temporary 457 migrants arriving in the Northern Territory was consistently less than a quarter of the population share, although increasing during the decade. It is also interesting to note the ongoing increase in the Northern Territory’s share of special eligibility and humanitarian visa arrivals. This stream may hold promise as a source of population growth into the future. This may be important given Australian Government changes to the temporary and permanent skilled migration programs implemented in 2017, including more restrictive eligibility and condensed skills shortages lists for the Employer Nomination Scheme visa (subclass 186) and Regional Sponsored Migration Scheme visa (subclass 187). 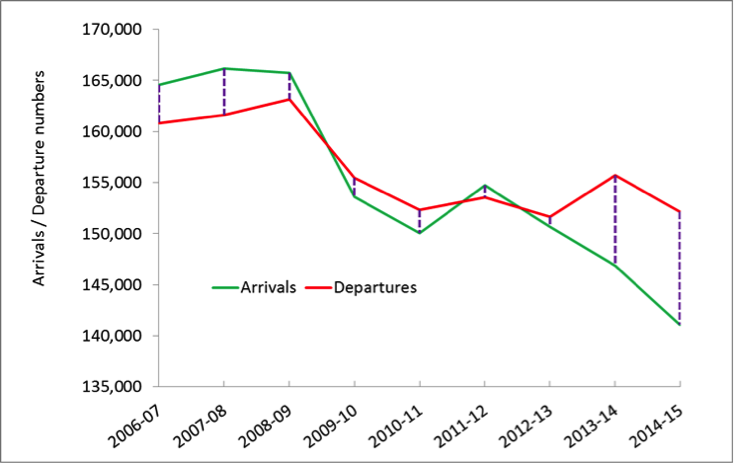 Similar analysis for retention shows the proportion of the national share of migrants leaving for overseas who originated from the Northern Territory (NOM departures) (Figure 9). Relative success in retaining migrants would be indicated by the share departing from the Northern Territory being lower than its population share of 1 per cent. The data suggest retention for all streams other than family migration is better than population share because losses are below the 1 per cent population line. Nevertheless, there was an increase in the relative loss of permanent skilled migrants over the decade, almost matching the population share by 2014–15. Putting together NOM arrivals and departures to investigate net overseas migration numbers by the main visa streams provides further perspectives. This shows that while 457 visa holders are under-represented in relation to the population for arrivals to the Northern Territory, they have been high net contributors relative to permanent skilled migrants (Figure 10). The rise in the absolute contribution of family migration observed in Figures 8 and 9 is also evident in the net figure with this stream contributing the most to net overseas migration by the end of the decade to 2014–15, at approximately 700 persons for that year. The broad conclusion from the case examples presented in this working paper are that the primary messages from past studies on migrants to northern and remote Australian regions purporting poor retention (of skilled migrants in particular) may need revisiting. The case examples also highlight the benefits of evaluations of targeted migration strategies and initiatives at local levels and from the perspective of population studies. While limited to the Northern Territory, these case studies are relevant for communities across northern Australia seeking to attract and retain skilled and other permanent migrants. Industries benefiting the most from the RSMS and SSRM programs in the Northern Territory include health care and social assistance, accommodation and food services, construction, and public administration and safety, all of which have faced shortages at various times. The data on the Northern Territory’s relative success in attracting and retaining its share of migrants across visa classes in relation to its national population share presents mixed results. While its record for attracting temporary migrants is good, it is not so good for skilled migrants in the permanent stream. Of equal concern is the diminishing retention of permanent skilled migrants over time relative to population share. However, growth in the relative and absolute contribution of family migrants to population growth in the Northern Territory is notable and this may be an area that northern regions can explore further to compensate possible dampening impacts from policy changes to skilled migration programs in July 2017. However, the combined picture is worsening national competitiveness for northern jurisdictions in relation to being able to attract and retain migrants who are vital to aspirations for economic and population growth, such as the ambitious targets articulated in the White Paper on Developing Northern Australia. The picture for migrants is mirrored for domestic migration to and from the region with a deteriorating net position for the north in recent years leading to low rates of population growth for the region as a whole and negative rates in some areas. Despite this, the Alice Springs case example highlights there is scope for major downstream impacts for communities from relatively small and localised initiatives. That study demonstrates the potential for international migrants to generate flow-on effects to enhance population growth. For Alice Springs, new migrant communities arrived at a time when the town and surrounding region was economically challenged and losing residents to interstate. The main question subsequent to their arrival in Alice Springs was the extent to which they would stabilise, grow, and remain in the town. New Census data shows that the fledgling Indian and Philippine communities in the town (the two largest new migrant communities) are now well established and growing rapidly. During 2011–16 the Indian community grew by 53 per cent (or 10.6 per cent per annum), while the Philippine community grew by 42 per cent (8.4 per cent per annum). At the same time, the resident population is estimated to have declined by 6 per cent. Under such circumstances the contribution of new migrants in Alice Springs to sustaining the town’s population, services, and economy are undeniable. Finding the right match between source regions, jobs, and migrants was clearly the key for the targeted Alice Springs approach. The continued rapid growth in the size of the communities from India, the Philippines and Zimbabwe in particular indicates that the town has encouraged these communities to stay and grow. 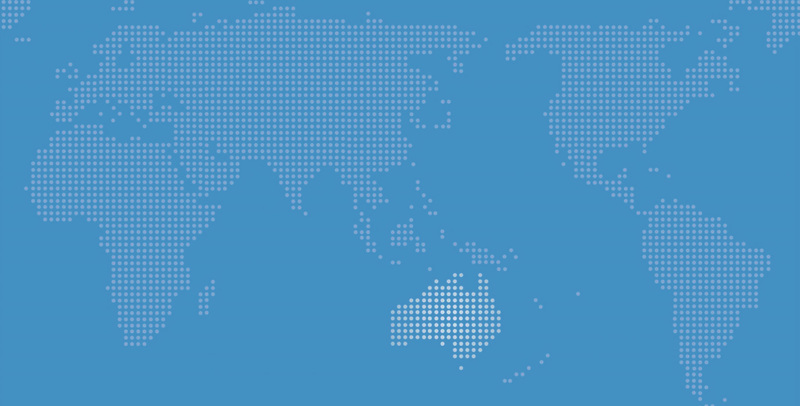 With a free trade agreement between Australia and China, currently only in the proposal stage, labour exchanges with northern Australia could foreseeably increase. 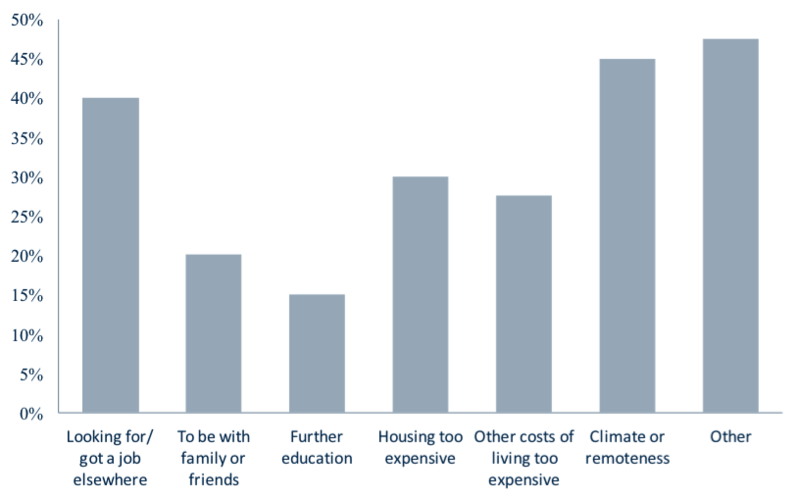 Importantly, it would be worthwhile exploring with these communities what factors have encouraged them to stay, as well as the reasons RSMS and SSRM holders gave for being likely to leave the Northern Territory (see Figure 7). Some factors such as climate and remoteness are unlikely to be overcome; however, there may be whole-of-government solutions which incorporate visa rules, tax benefits, and other incentives to live and work in northern Australia. Arguably there are a number in place and, arguably, their success is questionable. This highlights that something has and is going right in Alice Springs and the factors involved should be understood through research. The second case example on evaluating the SSRM and RSMS shows both schemes are lowering the age of the workforce, and the SSRM substantially so. Like most of regional Australia, the Northern Territory and northern Australian labour force is ageing and will face associated costs and skills shortages as a result. Skilled migrants are therefore helping to offset the impact of population and labour force ageing for the economy. High partnering rates, the female balance in the migrant cohort, and apparent desire to remain in the Northern Territory are also adding to population stability and growth. With high partnering rates, good actualisation of qualifications to employment, and community acceptance, Alice Springs and the Northern Territory more broadly are positioned to attract more international migrants. However, communities must work continually to ensure they and their families are welcomed, receive good education and housing services, and feel safe, since the happiness of accompanying family members has been shown as important to migrant retention in remote places. Individual regions should support a call for longitudinal research that plots the migration and life courses of workers and their families, who at some point have engaged with that region, to better understand local push and pull factors that determine the level of success of ‘embedding’ new migrants into communities in remote areas. This is particularly important after major changes to policy, including those enacted in July 2017 to the temporary and permanent skilled migration programs. Changes (largely tightening) to the skilled occupation lists and language requirements may affect the flow of skilled migrants to northern and remote Australia; however, a more definitive understanding on how and why would require robust evaluative research. This working paper has looked only at the main permanent migration streams and the temporary skilled (457) visa data. Other streams play a key part in determining the resident and actual populations in the region (which includes non-residents). The temporary working holiday and higher education visa streams, for example, accounted for more than half of all temporary visa arrivals to the Northern Territory in 2014–15. These temporary workers provide labour to industries with high seasonal fluctuations in labour demand. However, these are likely to further entrench the high rates of migrant turnover, despite some in these streams being able to permanently settle in Australia. Nevertheless, planned changes to the working holiday visa may enable holders to stay for two rather than one year, potentially reducing the short-term population turnover. Likewise, there are planned changes to the Seasonal Workers Program for workers from Pacific Island states and East Timor to help address seasonal labour demands. By attracting and retaining migrants, and especially skilled migrants, northern communities can cushion the effects of boom and bust population and economic cycles associated with resources and ongoing urbanisation. The overall impact of the conglomeration of successful local initiatives discussed in this working paper has been to improve the situation in relation to population growth (or at least to arrest the scale of decline), sustain a skilled labour pool, and grow the economy on a region-wide basis. These case studies also suggest that using the demographic lens for evaluating migrant attraction and retention programs is worthwhile. Collectively, therefore, the ‘bottom up’ approach is likely the real key to developing Northern Australia and provides a suitable lens for evaluating successes in terms of migration policy and initiatives. For governments, the case examples emphasise the need for strategic and collaborative approaches to attracting migrants to northern and remote regions. However, the work here recognises that, unfortunately, not all towns can or will experience population growth in the long run, leaving us with questions on how to provide suitable services, amenities, and socio-economic opportunities for those who remain. Dean Carson, Prescott Ensign, Rasmus Rasmussen, Lee Huskey and Andrew Taylor, “Perspectives on ‘Demography at the Edge’”, in Dean Carson et al eds, Demography at the Edge: Remote Human Populations in Developed Nations (Farnham, England: Ashgate Publishing, 2011), 3–20; Andrew Taylor, “Introduction: Settlements at the Edge”, in Andrew Taylor, Dean Carson, Prescott Ensign, Lee Huskey, Rasmus Rasmussen and Gertrude Saxinger eds, Settlements at the Edge: Remote Human Settlements in Developed Nations (Gloucester, UK: Edward Elgar, 2016), 3–24. Summarised from Carson et al, “Perspectives on ‘Demography at the Edge’”; Lisa Hörnström, Liisa Perjo, Ingrid Johnsen and Anna Karlsdóttir, “Adapting To, or Mitigating Demographic Change? National Policies Addressing Demographic Challenges in the Nordic Countries”, Nordregio Working Paper 2015:1, http://www.nordregio.se/en/Publications/Publications-2015/Adapting-to-or-mitigating-demographic-change; Andrew Taylor, Hannah Payer and Huw Brokensha, “The Demography of Developing Northern Australia”, Northern Institute Research Brief Issue 6, 2015, http://www.cdu.edu.au/sites/default/files/research-brief-2015-06.pdf. Productivity Commission, Transitioning Regional Economies, Study Report (Canberra: Australian Government 2017), http://www.pc.gov.au/inquiries/completed/transitioning-regions/report/transitioning-regions-report.pdf. Australian Government, Our North, Our Future: White Paper on Developing Northern Australia (Canberra: Australian Government, 2015), http://northernaustralia.gov.au/files/files/NAWP-FullReport.pdf. Taylor, Payer and Brokensha, “The Demography of Developing Northern Australia”. Australian Government, Our North, Our Future: White Paper on Developing Northern Australia, 7. ABS, “Regional Population Growth, Australia, 2016”, ABS Cat No 3218.0, 28 July 2017, http://www.abs.gov.au/AUSSTATS/abs@.nsf/DetailsPage/3218.02016?OpenDocument; Australian Government, Our North, Our Future: White Paper on Developing Northern Australia, 134. See, for example, Dean Carson, “Political Economy, Demography and Development in Australia’s Northern Territory”, Canadian Geographer 55, Issue 2 (2011), 226–242; Taylor, “Introduction: Settlements at the Edge”, in Taylor et al eds, Settlements at the Edge: Remote Human Settlements in Developed Nations. Ashley Manicaros, “Territory’s Lowest Unemployment Brightest Light”, NT News, 15 February 2017, http://www.ntnews.com.au/business/territorys-low-unemployment-brightest-light/news-story/23c767a8ddf9612e3ab1f9b3bd50fe67. See, for example, Taylor, Payer and Brokensha, “The Demography of Developing Northern Australia”. Productivity Commission, Transitioning Regional Economies, Study Report. Kate Golebiowska, “Are Peripheral Regions Benefiting from National Policies Aimed at Attracting Skilled Migrants? Case Study of the Northern Territory of Australia”, Journal of International Migration and Integration 17, Issue 3 (2016), 947–971. Siew-Ean Khoo, “Immigration Issues in Australia”, Journal of Population Research and New Zealand Population Review, Special Edition, September 2002, 67–78. Productivity Commission, Economic Impacts of Migration and Population Growth (Canberra: Australian Government, 2006), https://www.pc.gov.au/inquiries/completed/migration-population/report; Department of Immigration and Citizenship, “2010–11 Migration Program Report: Program Year to 30 June 2011”, 2011, https://www.homeaffairs.gov.au/ReportsandPublications/Documents/statistics/report-on-migration-program-2010-11.pdf. Department of Immigration and Border Protection, “2015–16 at a Glance”, https://www.homeaffairs.gov.au/about/reports-publications/research-statistics/statistics/year-at-a-glance/2015-16. Department of Immigration and Border Protection, “Regional Retention of Migrants: Critical Success Factors”, 2014, https://www.homeaffairs.gov.au/ReportsandPublications/Documents/research/regional-retention-migrants.pdf; Glenn Withers and Marion Powall, “Immigration and the Regions: Taking Regional Australia Seriously”, Report prepared for the Chifley Research Centre, October 2003. Andrew Taylor, Lauren Bell and Rolf Gerritsen, “Benefits of Skilled Migration Programs for Regional Australia: Perspectives from the Northern Territory”, Journal of Economic and Social Policy 16, Issue 1 (2014), Article 3. Department of Immigration and Border Protection, “Regional Retention of Migrants: Critical Success Factors”, 10. See, for example, Graeme Hugo and Kevin Harris, Population Distribution Effects of Migration in Australia (Canberra: Department of Immigration and Citizenship, 2011). Department of Immigration and Border Protection, “Regional Retention of Migrants: Critical Success Factors”. Michael O’Neil, Steve Whetton and Nicola Chandler, Review of State and Territory; Commonwealth; and Local Government Policy, and Attraction and Retention Activities, for Skilled Migrants in Regional Australia (Canberra: Commonwealth Working Party on Skilled Migration, 2009); Department of Immigration and Citizenship, “Factors that Influence Skilled Migrants Locating in Regional Areas”, 2010, https://www.dss.gov.au/sites/default/files/documents/01_2014/factors-influence-skilled-migrants-locating-regional-areas_access.pdf; Department of Immigration and Border Protection, “Regional Retention of Migrants: Critical Success Factors”. Department of Immigration and Citizenship, “Evaluation of Skilled Migration to the Riverina”, 2007; Graeme Hugo, “Australia’s State-specific and Regional Migration Scheme: An Assessment of its Impacts in South Australia, International Migration and Integration 9, Issue 2 (2008), 125–145. Department of Immigration and Multicultural and Indigenous Affairs, “Analysis of the Regional Sponsored Migration Scheme Subclass”, 2005; Department of Immigration and Citizenship, “Factors that Influence Skilled Migrants Locating in Regional Areas”. Graeme Hugo, “Australian Census Analytic Program: Australia’s Most Recent Immigrants”, ABS Cat No 2053.0 (Canberra: Australian Bureau of Statistics, 2004), http://www.ausstats.abs.gov.au/ausstats/free.nsf/0/2C95BF6FB48F0F2BCA256ECE007C345E/$File/20530_2001.pdf; Hugo and Harris, Population Distribution Effects of Migration in Australia. Dean Carson, “Conclusion”, Taylor et al eds, Settlements at the Edge: Remote Human Settlements in Developed Nations (Gloucester, UK: Edward Elgar, 2016), 427–434; Taylor, “Introduction: Settlements at the Edge”, in Taylor et al eds, Settlements at the Edge: Remote Human Settlements in Developed Nations. ABS, “Regional Population Growth, Australia, 2016”, ABS Cat No 3218.0, 28 July 2017, http://www.abs.gov.au/ausstats/abs@.nsf/MediaRealesesByCatalogue/28F51C010D29BFC9CA2575A0002126CC. Pawinee Yuhun, Andrew Taylor and James Winter, “Alice According to You: A Snapshot from the 2011 Census”, Northern Institute Research Brief 201301, 2013, https://www.cdu.edu.au/sites/default/files/research-brief-2013-1.pdf. Ibid; Taylor, Payer and Brokensha, “The Demography of Developing Northern Australia”. Kate Golebiowska and Dean Carson, “What is the Role of Net Overseas Migration in Population Growth and Interstate Migration Patterns in the Northern Territory?”, People and Place 17, Issue 3 (2009), 40–48. The survey was conducted under the project, “An Evaluation of Effectiveness of Skilled Migration Programs for the Northern Territory”. See also Taylor, Bell and Gerritsen, “Benefits of Skilled Migration Programs for Regional Australia: Perspectives from the Northern Territory”. Demographia, “6th Annual Demographia International Housing Affordability Survey: 2010”, January 2010, http://www.demographia.com/dhi2010.pdf; Andrew Taylor, “Darwin’s Housing Market: A Crisis for Whom?”, Population and Tourism Studies Research Brief 201053, Charles Darwin University, 2010, http://www.cdu.edu.au/sites/default/files/research-brief-2010-53.pdf. For more details, see https://www.border.gov.au/WorkinginAustralia/Pages/1-July-2017-changes.aspx. See, for example, Hugo, “Australia’s State-specific and Regional Migration Scheme: An Assessment of its Impacts in South Australia”. Department of Immigration and Border Protection, “Regional Retention of Migrants: Critical Success Factors”; Rural Health West, “Critical Success Factors for Recruiting and Retaining Health Professionals to Primary Health Care in Rural and Remote Locations: Contemporary Review of the Literature”, August 2013, http://www.ruralhealthwest.com.au/docs/publications/rhw_uwa_cucrh-contemporary-review-of-the-literature-f-lr.pdf?sfvrsn=2.